The FDIC (Federal Deposit Insurance Corporation) is an independent agency of the United States government that protects you against the loss of your deposits if an FDIC-insured bank or savings association fails. FDIC insurance is backed by the full faith and credit of the United States government. FDIC deposit insurance covers you dollar-for-dollar, principal plus any interest accrued or due, through the date of default, up to at least $250,000. For example, if a person had a CD account in her name alone with a principal balance of $125,000 and $2,000 in accrued interest, the full $127,000 would be insured, as long as the principal plus interest did not exceed the $250,000 insurance limit for single ownership accounts. Click Here to learn more about insuring deposits over $250,000. 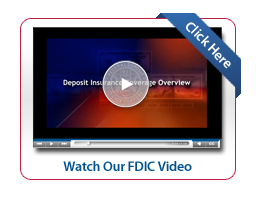 What does the FDIC Deposit Insurance cover?